The perfect lawn. The one with grass that feels exactly as it should when you walk over it. Healthy, under control, cultivated nature in your back yard. It’s no crazy thing to say that maintaining the perfect lawn can feel like painting a work of art that’s hell bent on trying to un-paint itself every other week. Fortunately, by working smart, you can alleviate nature’s attempt to grow weeds out of your Mona Lisa’s eyeballs. In this blog we’ll take a look at the essential strategies to help you achieve the level of lawn care that makes you feel like the lord protector of your garden, or something like that…whatever…it’s the guide to make you feel like a smart gardener. The sound of a ride-on mower rampaging past your bedroom window in the morning. Ah, the beautiful sound of lawn care. Much of the art to mowing a good lawn can be expressed rather simply: mow regularly, but not to a strict schedule – you should mow according to the growth of your grass. 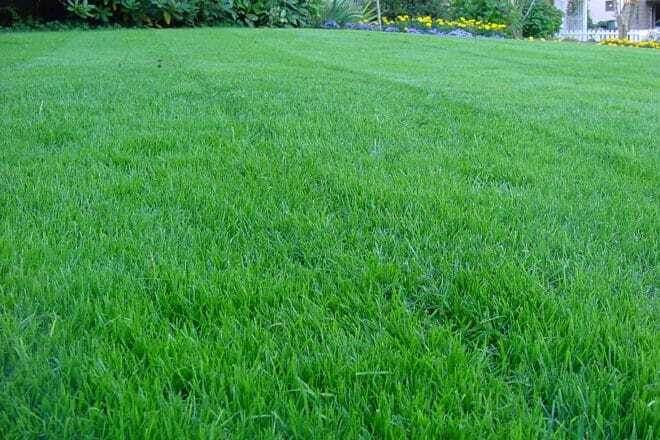 Whilst the particular height you should aim to keep your lawn at does vary slightly amongst types of grass, there is a useful rule of thumb to follow. It’s called the 1/3 rule. The idea is to mow no more than a third of the length of a blade of grass at one time. If in doubt, a good mow once a week should suffice, and perhaps two in spring. As for your mower of choice, the options are many. The right mower for you will depend on a number of factors. Below you’ll find a short list of the types of machine available. Manual reel mower: The more environmental option, these mowers can deal with smaller lawns with minimal bumps. Electric push mower: Whether battery operated or corded, these mowers can deal with small sized lawns, but do run into certain logistical difficulties, such as cord length and battery power. Walk-behind petrol powered push mower: With more power than their electric counterparts on a comparable to cheaper budget, these mowers require petrol re-fuelling. Ride-on mower: Petrol powered, these ride-on behemoths are the go-to if you want to mow large lawns in good time with reduced slog. Getting your lawn fertilization down is an absolutely crucial aspect of best-practice lawn maintenance. It’s recommended to fertilize a few times at the beginning of spring and once more in autumn. To lighten the burden of what can be a pretty big task, try dividing your lawn into sections and tackling it consecutively over a period of weeks. In summertime, if your grass fades and takes on more of a yellowish colour, try adding mineral supplements. For help choosing the right lawn fertilizer, as well as mineral supplements, consult a professional. When nature refuses to unload itself on your lawn causing a minor lawn-withering drought, before tossing it down like Niagara, you might be in a spot of bother. It’s the unpredictability of nature that can lead lawn masters to purchase irrigation systems that can detect the amount of water needed to maintain their lawn to an ideal degree. As a rule of thumb, most lawns require roughly an inch, or 2.5cm of water per week. If you’re choosing the installed irrigation option, it’s recommended to water weekly, rather than daily. A deep watering session once a week will promote a healthy underground root environment. Even if you’ve nailed everything above, poorly controlled lawn edges, weeds, and various types of lawn damage can undo so much hard work. It’s worthwhile to invest in a dependable lawn edger to make sure you reach the aesthetic standards you require. Hybrid whipper snippers that can take on anything from hedges to patio edges are often the most economical choice. As for weed control, the name of the game is early prevention. An application of herbicide to accompany your fertilization schedule is advised, whilst one-off treatments to problem areas may be called for later in the year. Take care, though, as a little goes a long way, and you don’t want to cause splash damage. The reparation of certain damages that can occur to your lawn is the final thing we’ll cover here. Damage in the form of disease, fungus, heavy usage, pests, pets, and traffic are all potential realities to content with. A product that combines seeding, fertilization, and mulch in one go might just be your best bet from an economical perspective to aid the repair of bald or damaged areas of lawn. If you recognise damage as it occurs and respond routinely, things shouldn’t get out of hand. And if you’re concerned about the discolouration of a patch of grass, take a high-quality picture and visit a professional.